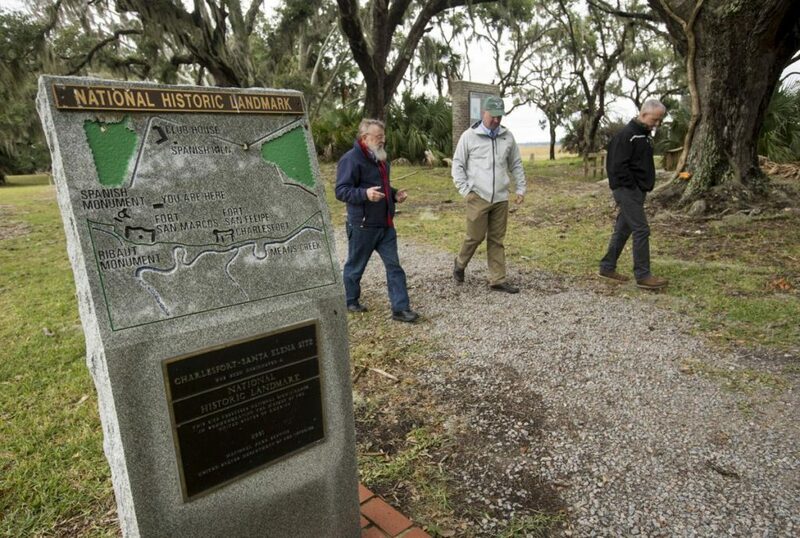 PARRIS ISLAND — As archaeologist Chester DePratter walked toward the tall stone pillar on this island’s southern tip, he underscored how much our knowledge of one of South Carolina’s most historic sites is subject to change. The impressive monument is an enlarged copy of the one French explorer Jean Ribault erected here more than four centuries ago when he founded Charlesfort in 1562, an early French outpost in the New World. The misplaced monument may be the most prominent example of how this site’s history is being rewritten, but DePratter later points toward a large oak tree not far away for a more recent example. It was here, under the oak, that he and archaeologist Victor Thompson recently used remote sensing devices — special equipment that detects soil disturbances underground — to find the location of Fort San Marco, one of several Spanish fortifications built shortly after Charlesfort. This Spanish fort is just a small part of a larger story only recently coming to light, at least in a public way. It’s a story of South Carolina’s first European settlement, one that took root a century before the English established Charles Towne — or Jamestowne or the Plymouth Colony, for that matter. It’s also a story of the former Spanish capital of La Florida. Dr. Andrew Beall, chairman of the Santa Elena Foundation, said the young organization spent 18 months figuring if there was a story here, who knew something about it, and how to present it to the public. The work is picking up speed. “It’s a lost century that’s not known by many,” he said. When Ribault arrived in 1562 with 27 men he considered Port Royal Sound the finest harbor in the world. Its breadth made it easily navigable and it was routinely flushed by a nine-foot tidal swing. From the tip of Parris Island, one can look toward the Atlantic Ocean, framed by modern day Hilton Head Island on the right and Bay Island on the left. His Charlesfort settlement would not last long. Ribault returned to France for supplies but never made it back. The remaining settlers abandoned the site. Meanwhile, the Spanish considered this territory part of their New World claim, part of La Florida, which covered everything north of Mexico. A surviving document shows they had named this area Santa Elena as far back as 1526, said Foundation member retired U.S. Army Col. Chris Allen. “Santa Elena is one of the oldest European place names in continuous use in the New World,” he said, surpassed in age only by Florida and Corpus Christi. The Spanish first staked their claim by creating a garrison in St. Augustine in 1565, then a permanent settlement in 1566 at Santa Elena, building atop the abandoned French fort. Santa Elena served as the Spanish capital of Florida from 1569 to 1587. A third European power, England, ultimately sealed the fate of Santa Elena. Prompted by Sir Francis Drake’s attacks on Spanish holdings in the Caribbean in 1586, Spain — stretched thin financially — decided to retrench in St. Augustine. “It dwarfed St. Augustine at the time,” Allen said. During its peak, Santa Elena had about 400 residents and dozens of buildings, including homes and churches. Allen said the story complements, not competes with, St. Augustine’s. After the Spanish abandoned Santa Elena to retrench in St. Augustine in 1587, the site never again became a town. More than a century later, the land eventually became part of a plantation. After the Civil War, the Marine Corps arrived here. While the corps once had an active encampment near the historic settlement, relatively little land was disturbed. In the mid-20th century, a golf course was built over part of it. Previously, archaeologists, including DePratter and the late Stanley South, had gridded off 34 acres and conducted 1,383 shovel tests. “What we found was the town of Santa Elena covers 15 acres,” DePratter said. But there are few surviving structures, aside from remnants of a kiln discovered during a previous dig. The kiln, which dates to about 1585, may be the oldest surviving European kiln in North America. Little else is left over. Thompson, who directs the University of Georgia’s Center for Archaeological Sciences, recently worked with DePratter on the site, using remote sensing equipment to try to create a map. They sent pulses and electric currents into the ground and measured differences in local magnetic fields in order to discern the locations of two missing forts, a church, shops and houses, as well as streets and a plaza. Their work also pinpointed the likely location of native council houses from the 17th century, sites of former slave cabins, and circular figures that appear to reflect Native American occupation from about three or four millennia ago. Among their biggest discoveries: the location of Fort San Marco, the third Spanish fort built on the site. The U.S. Marine Corps gradually has opened up the Charlesfort-Santa Elena site as more of its history has become known. In 2007, the Marine Corps reconfigured its Legends Golf Course in 2007, moving a few of its holes further away from the most historic acreage. The site reopened to the public Aug. 20, after restoration work was done after Hurricane Matthew damage from two years ago. Those visiting will find a trail with a series of markers explaining not only highlights about Charlesfort and Santa Elena but also its Native American, plantation and Marine Corps past. Meanwhile, the story of Santa Elena also is told in a small exhibit inside the Marine Corps Museum, where several artifacts from past digs are on display. These include assorted pottery shards, a small crucifix, a thimble, a tiny dice made of bone and other small bits. Together, they show the primitive, frontier-like conditions of the early European presence. But the story is best explained inside a new museum about 12 miles away in Beaufort. The Santa Elena History Center opened in April 2016 inside the former federal courthouse at 1501 Bay St., and it has expanded its exhibits several times since. The nonprofit running it is interested not only in presenting the story but also with funding research. Inside, its displays, video and living history try to explain both the 16th century history and the 21st century efforts to rediscover it. Beaufort County Councilman Stu Rodman serves on the foundation’s board and helped it secure the courthouse space to rewrite the area’s history in a more expansive way. “History is written by the victors, and the British were the victors, so the history started 50 years later in Plymouth,” Rodman said. As the detailed site map takes shape, archaeologists can plan future excavations on individual structures, such as the church, a house or a fort. “We know enough now that we can focus on small, specific targets,” DePratter said. Before any digging begins again, DePratter and others must reprocess (wash, weigh, reanalyze and rebag) the vast trove of artifacts already uncovered since archaeologist Stanley South began work here almost four decades ago. “Things he identified in 1979 are different than what we’d identify them as today,” DePratter said. He estimated that only about 5 percent of the site has been explored, meaning that there is much more to discover. As those mysteries are probed and solved, that will continue to thrust the story of Santa Elena into a more public light. This site represents one of the most important historical sites in South Carolina. Here in a relatively small and fairly undisturbed and protected area are the localities of three well-dated fort sites (two Spanish of 1566 and 1577 and one French of 1562) and two town sites, one at least of considerable size and with a time span of ten years. Not only does this represent the area of first European occupation, but the only French and Spanish attempts at occupation in South Carolina. The first historically reported structure was that of the 1562 French settlement, Charles Forte, established by Jean Ribaut. It was described as being a blockhouse of logs and clay, thatched with straw, with a ditch around it and having four bastions, by a member of the French expedition, Rouffi, who was captured by the Spanish after the fort had been abandoned. In 1566 the Spanish built a fort, named San Felipe, near the location of Charles Forte. It was manned until 1576 when an Indian uprising forced the Spanish to bury the heavier cannon and leave. Again in 1577 the Spanish relocated at Parris Island about 100 feet from the old fort San Felipe. The new fort was named San Marcos. It was constructed solidly of cedar and like its predecessor was also accompanied by a town. Listed in the National Register August 7, 1974; Designated a National Historic Landmark January 3, 2001. The site with Charlesfort and Santa Elena is on an active military base, so access is somewhat restricted. The Marine Corps Recruit Depot on Parris Island opens to the public, particularly on Fridays when recruits graduate, but visitors should be prepared to show identification, not arrive with any weapons and may be subject to other security measures. For more information, contact 843-228-2080. The Parris Island Museum opens from 10 a.m. to 4:30 p.m. with extended hours on Family Day of graduation weeks.